Real-time: AMOP messages do not rely on transactions and consensus. Messages are transmitted nearly real-time with only a few milliseconds delay between nodes. Reliable: When the message is transmitted by AMOP, it will leverage any feasible routes in the blockchain network.The message is guaranteed to be reachable as long as at least one route is available between sender and receiver node. Efficient: AMOP protocol is concise and clean. It takes very minimized CPU and network bandwidth. Secure: Supports SSL encryption on the network and the encryption algorithm is configurable. Easy to use: AMOP is embedded in the SDK. SF (Server Farm) area: Applications within the organization’s intranet can leverage the SDK to send AMOP messages to the proxy. If there is no DMZ, applications will link to blockchain nodes directly. DMZ (Demilitarized Zone) area: Physical or logical isolated network. This area is optional but recommended for better security. 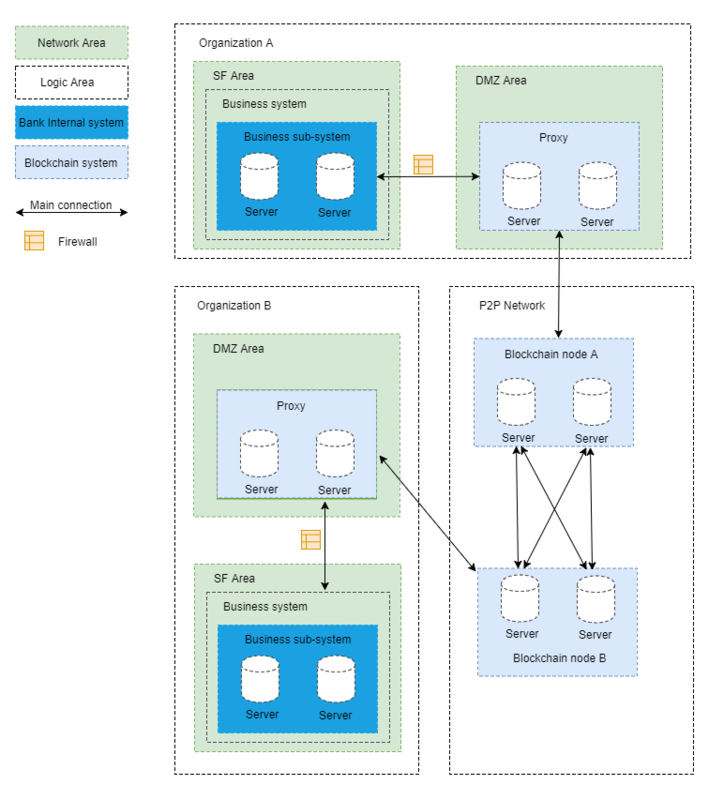 Blockchain P2P network: The logical area which contains blockchain nodes from different organizations. This is usually deployed within the DMZ zone but can also be placed in the SF area. Proxy Server: Responsible for forwarding messages from internal applications to the blockchain P2P network. It is recommended to place the proxy inside DMZ. The sending and receiving is based on publish-subscribe pattern. The server creates the topic and subscribes to it. Clients connect to the topic to send message to the server. Multiple topics are supported in a blockchain. There is no limitation for the number of servers and clients. If multiple servers are subscribing to the same topic, only the first available server will receive the message. 99: Message failed to deliver as there is no available route to the destination server. Check the node status with the sequence number(seq) generated while sending message as well as verify the route status. 102: Connection Timeout. The server may be overloaded or not reachable.